Cementum is a dental hard tissue that acts functionally in the insertion apparatus embedding the collagen fibers of periodontal ligament to the root surface. Cementum is a nonuniform, mineralized connective tissue composed by 50% of inorganic matrix in the form of hydroxyapatite crystals. Organic matrix consists of type I collagen fibrils (approximately 90%) and type III collagen fibrils (approximately 5%). Dental cementum also contains noncollagenous proteins, glycolipids, glycoproteins and proteoglycans. As an avascular tissue it does not undergo continuous remodeling. The cementum-dentin junction is characterized by penetrating cytoplasmic processes of pre-cementoblasts in the array of pre-dentin with subsequent deposition of collagen fibers, forming interdigitations. 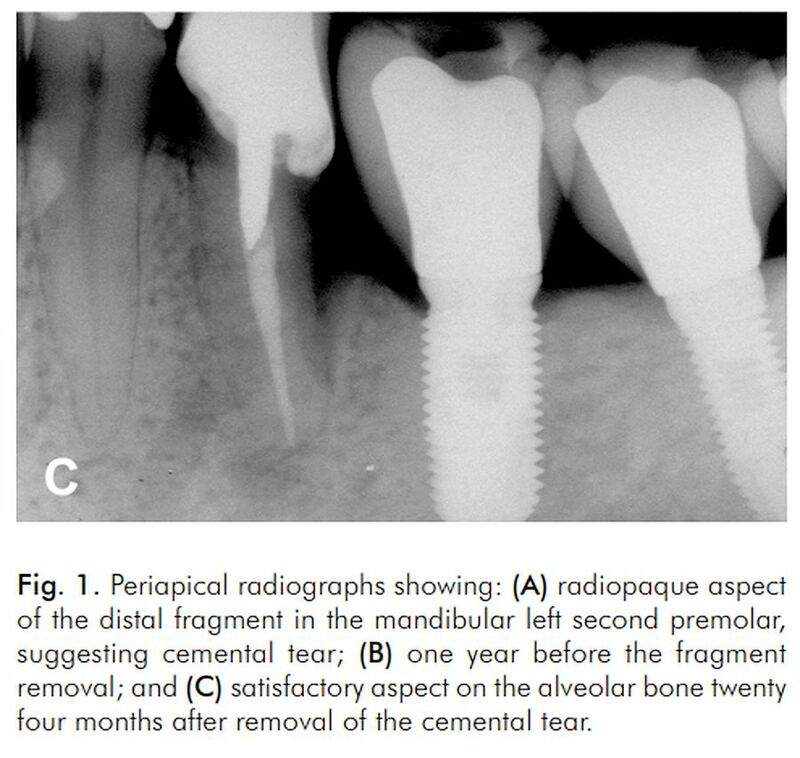 Cemental tear has been described as an rare periodontal condition characterized by a total or partial separation of the cementum. This detachment mainly occurs in the cementum-dentin junction, and may also include dentin . According to the current classification of periodontal diseases, cemental tears are categorized as localized tooth-related factors that modify or predispose to plaque-induced gingival diseases and periodontitis.